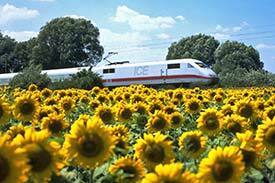 ABOVE: An ICE 1 train speeds past a field of sunflowers. To most passengers, all Intercity-Express trains look pretty much the same: They're long, streamlined trainsets with pale grey (almost white) paint and red stripes along the side, and all offer high standards of comfort. ICE 1 trains were introduced in the early 1990s. The trainsets have power cars, or locomotives, at each end and passenger cars (including a tall BordRestaurant dining car) in between. ICE 2 trains are a bit more streamlined than their ICE 1 counterparts, with a BordBistro café/restaurant that looks almost identical to the standard passenger cars. ICE 3 trains have bullet noses and no separate power cars: motors and other electrical components are beneath the floors of the passenger cars, making it possible to offer a "lounge seat" compartment directly behind the engineer's cockpit at each end of the train. Passengers can watch the driver and the tracks ahead through a floor-to-ceiling glass partition. Lounge seats are also available on ICE T trains, which are similar to ICE 3 trains but include a tilting mechanism to allow faster speeds on curved track. ICE or standard Intercity-Express trains offer first- and second-class seating. Reservations are optional on most routes, though they're recommended at busy times. ICE Sprinter trains are special morning and evening limited-stop expresses on crowded corridors such as Frankfurt-Berlin, Duisberg-Hamburg, and Dortmund-Cologne-Stuttgart-Munich. You'll need reserved seats on these trains, and while the reservation fees are higher than on standard ICE trains, you'll get a newspaper in second class or a newspaper, drink, and meal at your seat in first class. 2nd inset photo copyright © Eurail Group.